In a welcome development, war veterans have now joined the military in saying on the record that they will not stand in the way of opposition leader Nelson Chamisa if he defeats President Emmerson Mnangagwa in the crunch July 30 polls. This comes as the run-up to the polls has been marred by threats and underhanded campaigning methods which have heightened fears that the outcome of the elections will be disputed again. The polls will be the first ever since Zimbabwe’s independence from Britain in 1980 not to feature former president Robert Mugabe, who resigned from office last November after Parliament had started damaging proceedings to impeach him. The elections will also, for the first time in two decades, not include the late popular founding president of the MDC — Morgan Tsvangirai — who lost his valiant battle against colon cancer earlier this year. The chairperson of the Zimbabwe National Liberation War Veterans Association (ZNLWVA), Christopher Mutsvangwa, told the Daily News yesterday that ex-combatants would not stand in the way of the youthful Chamisa if he prevailed in the impending elections. “As war veterans, we believe in the voice of the people, that only the people through an election will decide the country’s leadership and that their decision must be respected by all. “The biggest difference between Mugabe and President Emmerson Mnangagwa is that the latter is a lawyer, a super democrat who believes in constitutionalism and will always respect the country’s laws. “And so, the Constitution will dictate what happens after these elections,” the forthright Mutsvangwa said. The former Cabinet minister spoke after he had been trolled on micro-blogging site Twitter, where an apparently fake account using his name alleged falsely and outrageously said that war veterans would not accept an opposition victory in the much-anticipated polls. “Counting down ... Let’s all vote for Zanu PF and avoid spilling of blood. We will never allow anyone with no war credentials to rule Zimbabwe,” the fake account said. Mutsvangwa said emphatically that he was not on Twitter — blaming his rivals in the fiercely-contested Norton constituency for allegedly trying to smear his name. “I have no Twitter account and so I have absolutely nothing to do with that. It should be the work of my rivals who are finding it difficult to catch up with my work ... they clearly created the fake account and went on to glibly comment on their own posts,” he said. The war veterans’ statement that they will respect the outcome of the polls comes after the military also said they will abide by the country’s Constitution and respect whoever emerges the winner of the July 30 presidential plebiscite — which has generated a lot of interest among the general public and the international community. “The position of the Zimbabwe Defence Forces is that we abide by the Constitution ... our conduct is going to be guided by the Constitution. “The conduct of the Zimbabwe Defence Forces will remain guided by the Constitution and we will not change from that,” military spokesperson Colonel Overson Mugwisi told journalists at the beginning of this month. The military spoke then just weeks after controversial deputy Finance minister and Zanu PF candidate for Harare East, Terence Mukupe, had set tongues wagging after he claimed that the army would not recognise Chamisa if he defeats Mnangagwa in two weeks’ time. “Our country, given where we are and where we are coming from, needs a mature person, a steady hand. “We cannot say, honestly, the army took the country, practically seized the country from Mugabe, so that they can hand it over to Chamisa. “How can we say honestly the soldiers took the country, practically snatched it from Mugabe, to come and hand it over to Chamisa? “I don’t think that I am mature enough to be given the country to run and all the soldiers in this country salute me saying the commander-in-chief is here,” Mukupe was shown saying in a damning video evidence. The military and war veterans were fingered in previously disputed elections as having played prominent roles in ensuring both Zanu PF and Mugabe’s victories against the opposition. One such example was in the 2008 presidential election which was widely condemned by the international community as having been seriously flawed. In that year, Tsvangirai beat Mugabe hands down. However, the results of those polls were withheld for six long weeks by stunned authorities — amid widespread allegations of ballot tampering and fraud, which were later revealed by former bigwigs of the ruling Zanu PF. In recent weeks, the election mood has changed with the opposition triggering fears that Zimbabwe is once again headed for a disputed poll — after the MDC Alliance insisted that it will announce the results of the keenly-anticipated plebiscite before the under-fire national elections management body, the Zimbabwe Electoral Commission (Zec), does so. 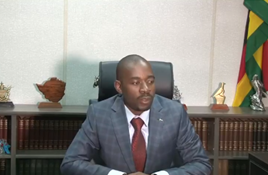 Chamisa, who was the first to warn that he would announce the results of the polls before Zec on Wednesday last week — was joined by his key lieutenant, Tendai Biti, who repeated the same during a rally in Mutare at the weekend. Biti was arrested in 2008 and charged with treason for prematurely announcing the results of that hotly-disputed poll, but still vowed at the weekend to repeat what he did a decade ago. “I know I was arrested the last time I announced the results, but let me tell you that I am going to do it again after the July 30 elections because we have no confidence in Zec,” he told supporters at the MDC Alliance’s weekend rally. The treason charges against him were only dropped when Mugabe was forced into forming a government of national unity with Tsvangirai, as Zimbabwe crumbled under the weight of a worsening economic crisis that was occasioned by political mayhem. This year’s elections have generated a lot of interest among both ordinary Zimbabweans and ambitious politicians alike, with many people anticipating a close contest between Zanu PF and the MDC Alliance.